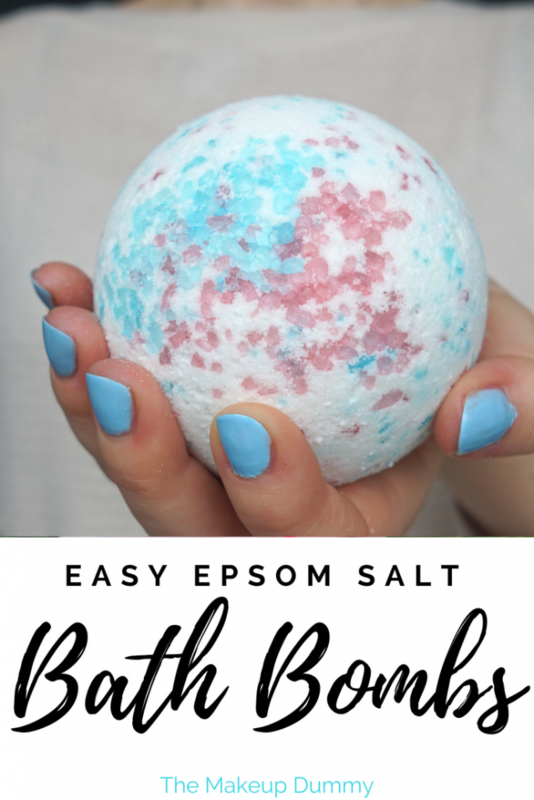 This is a fun twist on the classic DIY bath bombs recipe. If you’ve never made your own bath bombs before, I can highly recommend it! 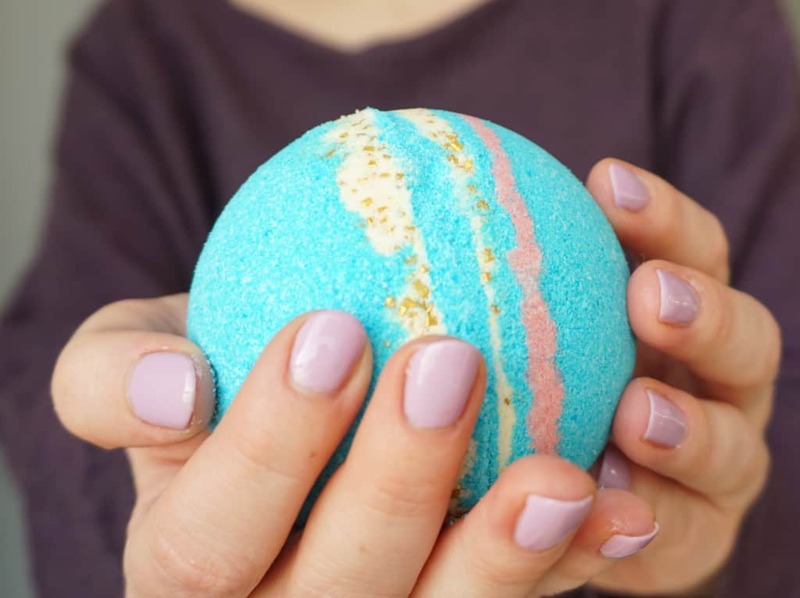 DIY bath bombs are a lot easier to make than you’d expect, and you can customize them with your own, scents and colors. Just like I did with this recipe. Instead of coloring the mixture, I colored the salts. The effect turned out even better than I could have imagined! Choose your favorite color (Pink or blue for a baby shower? Red and green for Christmas?). Add your favorite essential oils and you have the perfect homemade gift. Or keep them all for yourself. 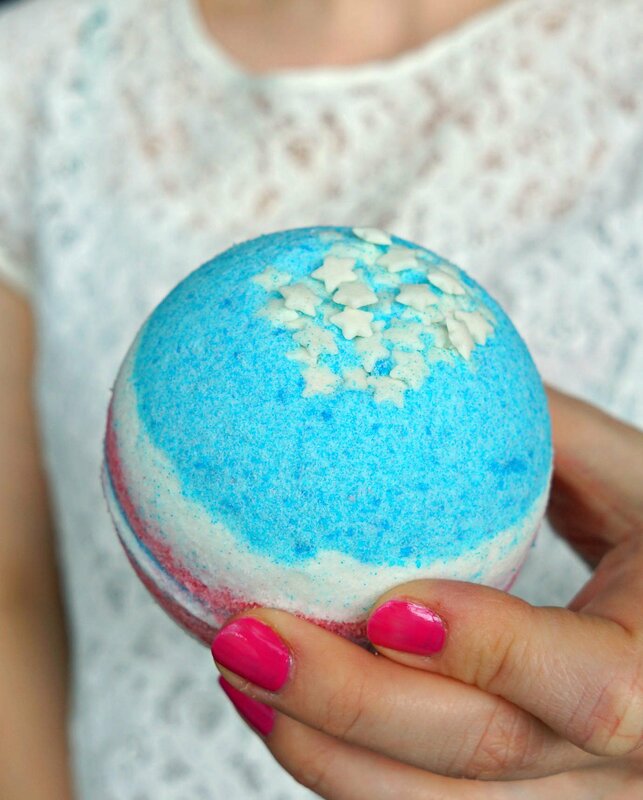 Because these DIY bath bombs are the perfect relaxing spa treat! 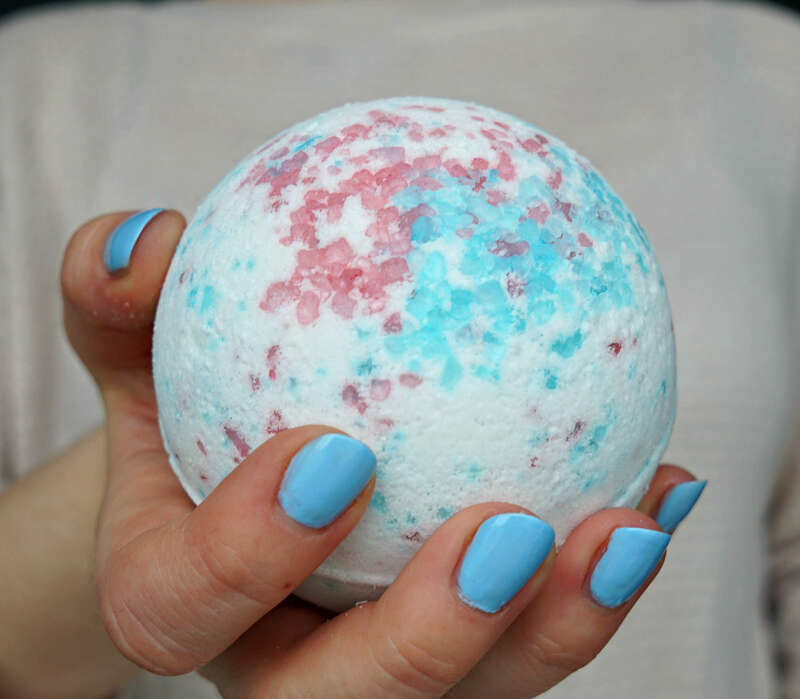 This recipe makes about 1 giant bath bomb (LUSH size) or about 3 medium sized ones. You can easily double or triple the ingredients to make more. Follow along these easy steps, or scroll down for a printable recipe. 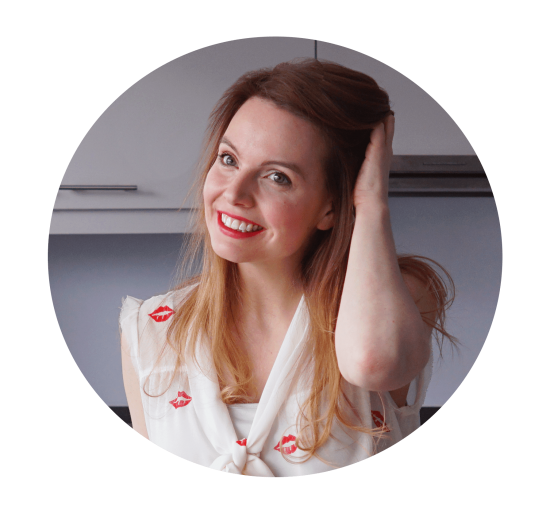 To help you find the ingredients you need for this tutorial I’ve added links in this post to places you can find them online. I’m part of the Amazon affiliate program so I get a small commission when you buy something via these links. For me it’s a win-win and I spend that money to make more bath bomb tutorials for you ? But feel free to Google the ingredients to find your own or buy them from local vendors in your area! Divide 3 tablespoons of Epsom salt between 2 bowls. Add one drop of food or soap coloring to one bowl and add a drop of another color to the other. Add more drops for a more intense color. Stir to evenly distribute the color over the salts. Let the salts sit while they soak up the dye. Divide the salts over more batches if you want to use more colors. Put the baking soda, cornstarch and citric acid in a large mixing bowl. Whisk together with a spoon or fork. This would also be the time to add your essential oils. I used 6 drops of ylang-ylang and 6 drops of lavender. Lavender is a great choice for its relaxing properties and ylang-ylang has a beautifully sweet scent. Add 1 heaping tablespoon of coconut oil to your dry mixture. Mix all the ingredients together and make sure to smooth out all the lumps. If you want you can melt the coconut oil first. This will make it easier to mix the oil with the rest of the ingredients. If for some reason you prefer to not use coconut oil (for example if you’re allergic), you swap it with another carrier oil, like olive oil or almond oil. Take a handful of the mixture and squeeze it together with your fingers in the palm of your hand. The powder should clump together. If it doesn’t you can spritz it lightly with some water (or witch hazel) in a spraying bottle. Stir well between each spritz and make sure the mixture doesn’t start to fizz in the bowl! Check regularly to see if the mixture clumps together. Once the mixture looks like damp sand, it’s ready. Add the colored salts to the batch. Carefully stir the salts into the mixture. I put a few salts at the bottom of my mold because, well, it looks pretty! Fill your mold one spoonful at a time. Press the mixture down firmly after each scoop. Let your mold sit for a few hours or – if you can wait long enough – overnight. Carefully take the bath bomb out of its mold and wrap as a gift or keep for yourself! Divide the epsom salt between 2 bowls. Add one drop of food or soap coloring to each bowl and stir well to evenly distribute the color. Let the salts sit while they soak up the dye. Combine the baking soda, corn starch and citric acid in a large mixing bowl. Whisk together with a spoon. Add a few drops of essential oil while you keep stirring. Add the (melted) coconut oil to your dry mixture. Mix all the ingredients together and make sure to smooth out all the lumps. Take a handful of mixture and squeeze it in the palm of your hand. Spray the mixture with some witch hazel until it clumps together. Stir well between each spritz! Add the colored salts to the batch and carefully mix together. You can keep a few teaspoons of salt and put them at the bottom of your mold. Press the mixture down firmly as you fill your mold. Let it sit for a few hours. Carefully take the bath bomb out of its mold. Go to www.themakeupdummy.com for more DIY Beauty recipes! I buy mine from Heirloom just google it. Hi Cameron, there’s a link in the ingredients list to buy citric acid online. You can usually also find it in the canning aisle at your grocery store. You can get it from the health store, powdered. When you use dues doesn’t that come out in the bath . Would it not stain the bath?? Just got some at Walmart by the canning products. Um you say to add coconut oil but there’s no coconut oil in the list of ingredients you’ll need. Use a plastic ornament. They sell them in the craft section at most stores. I think I got mine from hobby lobby. They’re for people who make their own ornaments so they come in two pieces that snap together or snap off. I love these bath bombs they make my baths so relaxing! I love these bath bombs! About how many bombs does this recipe make? Does this stain at all? These look so beautiful! 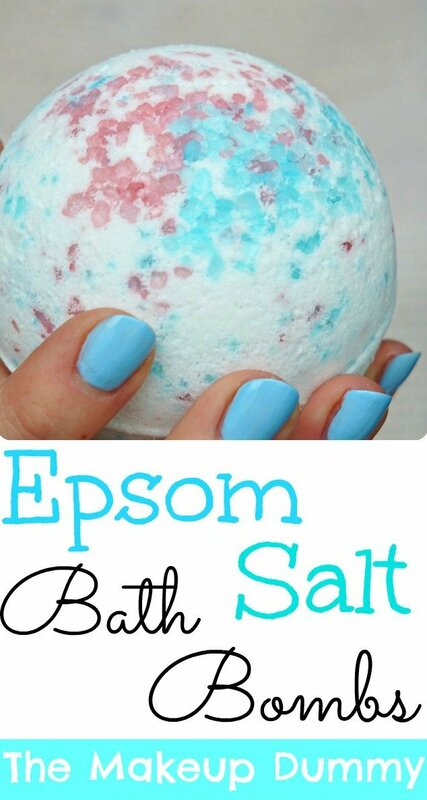 I love the idea of coloring the epsom salt before you add it. So excited to try this out! Thanks, Tash! Let me know when you do! Excuse me, I was just wondering if the food colouring stains your body or the bath tub and if this recipe is alright for sensitive skin. 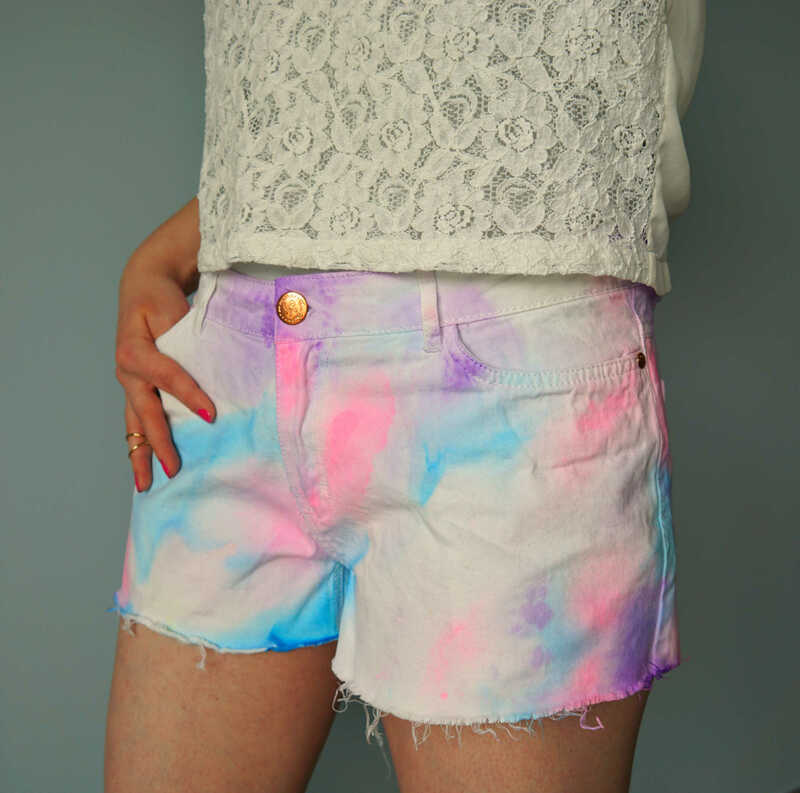 Doesn`t food colouring stain so if could stain on your body or bath tub. Please say you have experimented it because I want to use this recipe to make a bath bomb for my sister and she has very sensitive skin. If this recipe is not okay for sensitive skin, please reply to me which recipe is alright for sensitive skin. Thank you so much! Your bath bombs look radiant though! Have a question. I made these last night and the texture is perfection….seriously….however they did not hold together at all when I took them out of the molds…..To much cornstarch maybe?? Adivse??? Hi Kathy! Make sure to really press the mixture down firmly with your fingertips as you fill up your mold. If the mixture feels damp still it’s also possible you’ve used a little too much oil or water. Hope this helps! can you make the bath bomb without coconut oil? i am trying to make some for my nephew, but he is allergic to coconut oil. Yes! You can use a different oil or leave it out. How many bombs does this make. 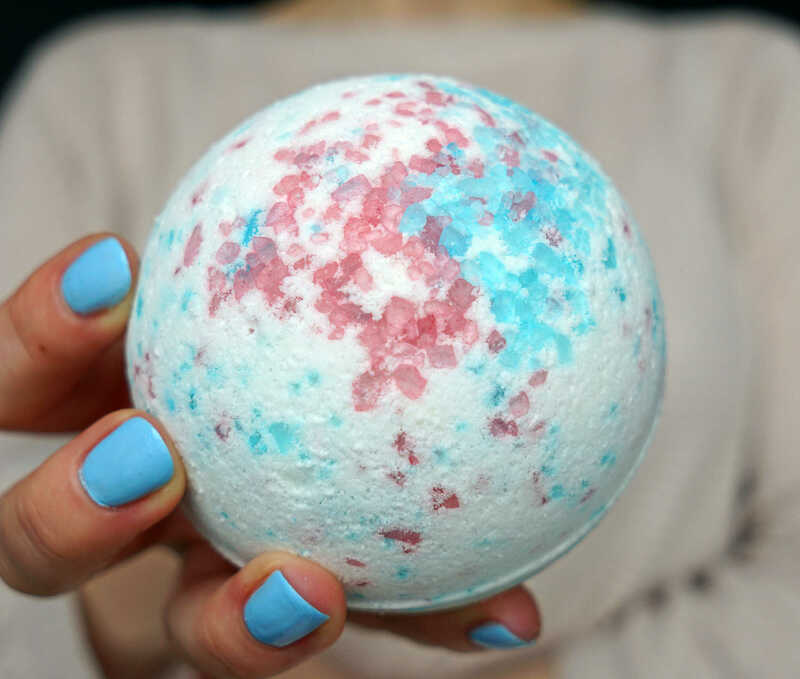 This recipe makes one giant bath bomb or several smaller ones. You can also double or triple the recipe if you want more. Hi! I’m trying to make some bath balls for Christmas presents but am having trouble finding fine grain Epsom salt, even on Amazon. There are tons of choices for fine grain Dead Sea salt, would that work just the same? Where do you get your Epsom salt? Does it even need to be fine grain? Sorry for so many questions, Thanks for your time. Coarse Epsom salt actually works best! I am allergic to citric acid. Is there an alternative? You can try this recipe with cream of tartar! Same measurement as the citric acid? I haven’t tried this myself, but I would use half the amount. So 1/8 cup of cream of tartar. I plan on trying this myself soon and make a blog post about it. No, the coconut oil I use is at room temperature. What if the coconut oil is hard like shortening -actually a little bit harder? Wouldn’t you have to melt it just to blend with the other ingredients??? About how many bath bombs does this make? Hi! These look really cool! Can you substitute orange juice for citric acid? Hi Debby, I have a recipe for DIY Bath Bombs with lemon juice, but I’ve never tried orange juice before! Do you put the Epsom salt just on the bottom or do you mix it it the bomb too ? Hi Melissa, I put a few on the bottom and mix in the rest with the other ingredients. Thank you was also wondering if you use course salt cause my Epsom salt isn’t that course to make them look like yours. The dyed Epsom doesn’t show up us good as yours ? Yes, I did use coarse salt. You can try adding more dye? I’m sure yours look beautiful in their own unique way! Hi! I saw your other recipe using lemon juice, can you substitute lemon juice for citric acid in this recipe also? Hi Megan, I haven’t tried this myself. I’m not sure how the salt and the liquid lemon juice will react. If you do try it definitely let us know! I think the easiest option is to wait and order some citric acid for example from mountainroseherbs or amazon. I’ve used your recipe twice and both times it turned out perfect! The only change I made was to melt the coconut oil and add a dash of food coloring to that before I added it to the dry ingredients. You are right…. the key is to really smash the ingredients into the mold tightly. Thanks for the recipe!! Thanks Kimberly! I’m glad you like it! Hi, how long does the Epson salt have to sit in the coloring and do I let them dry before using them? Hi Rose! Yes, you have to let the salt dry first. I recommend only using a drop or 2 of coloring, and then they should dry pretty quickly! Hi! I did this DIY and I would suggest using powdered food coloring ( I found it at Walmart in the cake section) it makes them more dry so the bath bomb does not activate. Also what do the bath bombs feel/look like when they are ready to be done? 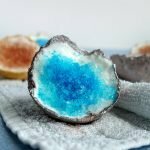 Hey, I am planning on making this beautiful bath bomb and was wondering if it is necessary to have Epson salt? Could I use relugar salt that has large chunks? Yes, coarse sea salt works just as well! Is the mixture supposed to be a powder or like dough? I just made these up and am so excited to use them! They look beautiful. I used green coloring for the salt and the scent is coconut lime. Thank you! Mine crumbled and never came out of the mold, the texture was perfect while mixing… I left it for 24 hours…. I was so disappointed. I made bath bombs before, with success, I haven’t a clue what happened. Can you please share the quantity this recipe makes? Am planning a program and would like to know how many molds and materials I need to get. Also any way you can make a cool PDF printable for the recipe? Would like to give as a handout and would look a lot better than a bunch of screen grabs. 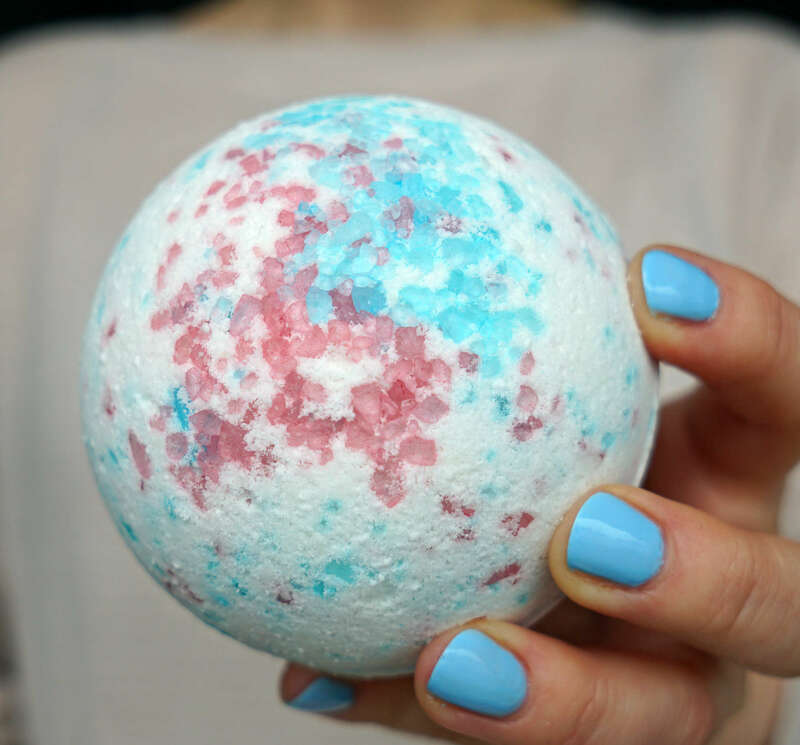 Hi Emily, this recipe makes 1 giant bath bomb (like the ones from Lush) or up to 3 medium sized bath bombs. I’ve added a printable version of the recipe to this post (which can also be saved as a PDF). Have fun and thanks for sharing the DIY love! Hi! I’d like to do this DIY craft for the adults at my library. Would it be okay if I used your image to promote the event to my community? It would go on social media posts and flyers around the library. Thank you! I’d like to know the answer to Jessica’s post on Feb 6! I am having the same problem. I’m using Easter eggs. The mixture explodes out of the egg even holding it shut with stiff rubberbands. I keep scraping the excess off. The when it was dry I could not get it out of the egg and it ended up crumbling. Do you have to use witch hazel or can you just spray with water? Thanks! Hi! I have made 6 of these and only 1 has come out as a whole ball. As I’ve pulled the other ones apart (I have the metal mold that is two pieces) it just splits in half as if the two halves did not fuse together. Any suggestions? Hi Lindsay, you probably used a little bit too much liquid. When the bath bomb is still wet it can pull apart. Keep trying, I’m sure you’ll find the right ratio next time! Hi there I tried these last night and let them sit overnight but they completely crumbled. Rather than using a squirt bottle, is there a measurement of water to pour into the mixture so I don’t over or under spray? I would love for them to stay whole. It’s fun to go to a thrift store and get your molds. I happened upon a mini metal owl cake mold and they are so cute. I spray a little coconut oil into the molds to get them to come out easier. Not too much, though! I love this recipe. It might just be my favorite and I’ve made many varieties. Can I use baby oil instead ? Hi Madison, I have a tutorial for bath bombs with lemon juice here on my website as well. It works, but it’s not the same. If you want the same effect as a store bought bath bomb, you’ll need citric acid in powder form. Hi Tiara, I wouldn’t choose castor oil for a bath bomb. Great substitutes are olive oil or sweet almond oil. You can also leave out the oil.